As a master baker, painter and woodworker, Stephen Lanzalotta has been using the mathematical principles of The Golden Ratio (an integral plot element in The Da Vinci Code) for more than 30 years. His realization that this seemingly magic formula, used by Da Vinci and other geniuses of the Renaissance, held the secret to optimal health and weight loss led him to apply it to his own eating plan and the menu offerings at his popular bakery/café. Thus was born THE DIET CODE, a revolutionary and unique Mediterranean-style eating program that uses this ancient numerical sequence to link together the proper proportions of carbohydrates, proteins and fats to boost the metabolism and spark weight loss. 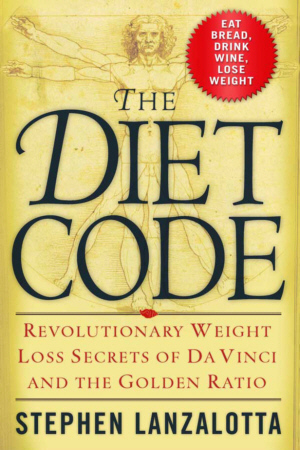 Combining detailed menu plans, recipes, and nutritional information, as well as sidebars with Renaissance lore and personal stories about what the author learned about a well-balanced diet from his Italian grandparents, THE DIET CODE is a unique health and weight loss program from the ages for the ages.